Thanks to the movie Field of Dreams, almost everybody has heard of Moonlight Graham. As a right fielder for the New York Giants, Archibald Wright “Moonlight” Graham made his Major League debut on 29 June 1905, at the age of twenty-seven. In the bottom of the eighth inning against the Brooklyn Superbas, Graham came into the game as a defensive replacement for George Browne. He never had the opportunity to step up to the plate, however, standing in the on-deck circle as Claude Elliott flied out to end the top of the ninth. Graham played again defensively in the bottom of the ninth, but never had the chance to record an at-bat as the Giants won 11-1. It would be his only Major League appearance, as he was sent back to the minors the following day. Completing his medical degree from the University of Maryland in 1905 (where he also played halfback for the school’s football team in 1904 and 1905), Graham concluded his baseball career in 1908. He went on to obtain his license and began practicing medicine in Chisholm, Minnesota. “Doc” Graham served as a good and loyal doctor to the people of Chisholm for fifty years. He died in 1965. In 1975, W. P. Kinsella happened to read about Graham’s short-lived baseball career in The Baseball Encyclopedia. He included Moonlight Graham as a character in his 1982 novel, Shoeless Joe, on which the movie Field of Dreams is based. 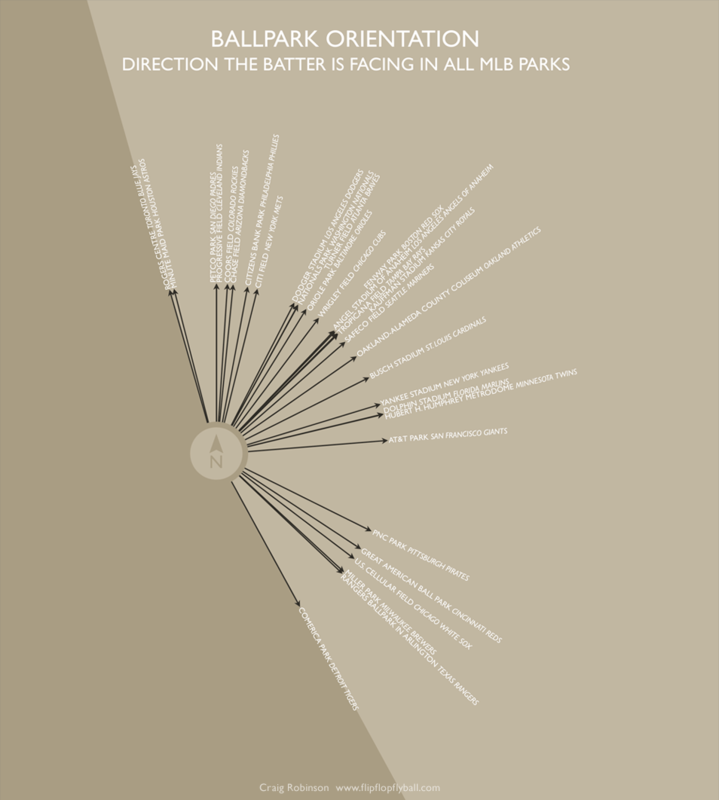 This is a fascinating infographic I found from 2009 showing the orientations of all Major League ballparks. It reveals a pretty cool and interesting trend. On 24 June 1936, twenty-one-year-old Joe DiMaggio hit two home runs in the fifth inning against the White Sox at Comiskey Park. This made the rookie outfielder the first Yankee and the fifth Major League player ever to accomplish the feat. The Yankees defeated the Sox 18-11. Sometimes, if you’re a pitcher, it seems elusive. If you’re a batter, it can sometimes seem larger than life. The strike zone — in some ways, it is baseball’s version of the Twilight Zone: sometimes it’s hard to tell where it really is. Or, to make things simpler, many regard the area from the elbows to the bottom of the knees as the vertical axis of the strike zone. 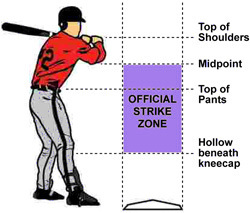 The size of the strike zone has not remained static through the years. Major League Baseball will sometimes make the official strike zone larger or smaller in order to maintain a balance of power between pitchers and hitters. For example, after Roger Maris broke Babe Ruth’s home run record in the 1961 season, the strike zone was stretched to extend from the top of the batter’s shoulders to the bottom of the knees. Then, in 1968, pitchers such as Don Drysdale, Bob Gibson, and Denny McLain utterly dominated hitters. As a result, not only was the size of the strike zone reduced in 1969, but the height of the pitchers mound was also reduced from 15 inches to 10 inches tall. At the end of the day, though, enforcement of the strike zone lies with the home plate umpire. As any player or fan of the game knows, the size — and, sometimes, even the shape — of the strike zone can vary from one umpire to the next. As a result, pitchers and hitters often find themselves having to adjust their expectations according to those of the umpire. And, sometimes, the umpire can be the most loved or the most hated person in the ballpark. What’s true for the people who play baseball is true in different ways for those of us who mostly just watch it. On the one hand, a baseball stadium becomes a kind of home for many of us who go often. Whether it’s a big league stadium where you can leave your peanut shells scattered beneath your seat or a high school field where you know the person who chalks the base paths every Thursday, it’s a personal space. You can keep score with your private notation system, sound of authoritatively on what Bud Selig is doing wrong, or tell an ump that he’s missed a call even when you are 140 feet and a bad angle away from the plate.